One in five people live in multi-generational homes. Here are design ideas and insights for making it work. The trend of separate households for nuclear families that became the standard after World War II is changing. Right now, 20 percent of the U.S. population lives in multi-generational households. And the trend is growing. Many families would rather have their parents at home than in an assisted living facility. Often, they use money that would have been used for a facility to remodel or build spaces that fit their needs. And young adults are waiting longer than their parents to get a job, marry and have children. In fact, more than one-third of 18- to 34-year-olds live with their parents. Families have become very flexible with their living arrangements. Builder Online says, “The main objective when designing a multi-generational home is to create a well-organized space that ensures good relations among family members.” This means providing adequate privacy, as well as spaces for the family to come together. Some families opt for two homes under one roof. They separate the house into sections and provide separate appliances and entrances for each section. Other families adapt the design of an existing home. For example, dual master suites work well for many blended households. Instead of building a full-size second kitchen, a kitchenette may be all that’s needed to provide privacy and autonomy between multiple adult generations. Finishing spaces above a garage is another way of gaining space for the family without increasing the size of a home’s footprint. If you have a three-car garage, you can subdivide it so two spaces serve the main house and the third space serves as a private entrance to the living space above the garage. Families must also address the needs of aging in place. Eliminating stairs and trip hazards, installing grab bars and wider hallways and doors make daily activities easier for family members with physical limitations. There are many advantages to living in multi-generational homes, including building stronger relationships and saving money. If you’re thinking about asking a parent to move in with you, here are eight questions to ask first. 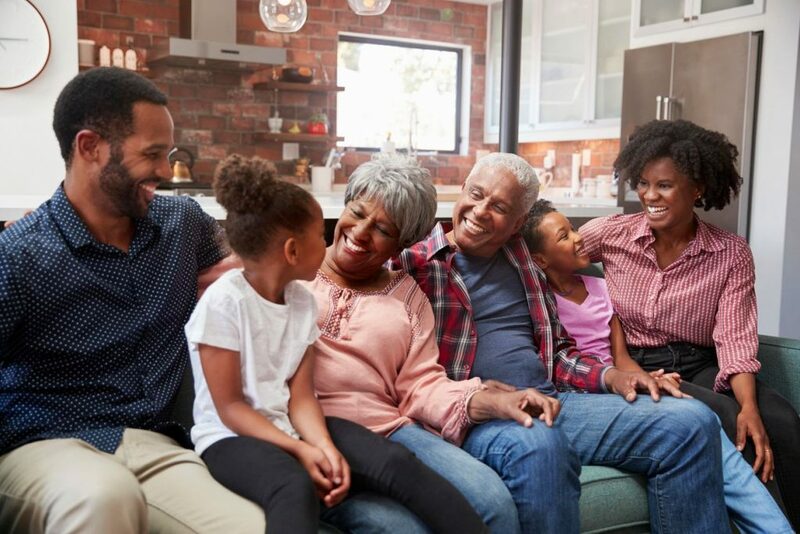 If you agree to letting adult children return to the nest, here are four ways to make your multigenerational home a positive experience. If you have questions about financing renovations for your multi-generational home or purchasing a bigger home to house your extended family, talk to one of our Consumers loan officers at 800-991-2221. They’ll provide you with a customized solution.